Thinking of “Better Read Than Never” – my cleverly named series of reviews on books that are “yesterday’s news” (but not for me) – my tendency to untimely reading isn’t limited to novels. My mind being what it is, I decided to finish off the November 2014 edition of The Atlantic, an interest-packed number of a great old magazine. A James Parker piece on the “rock-star poet” Dylan Thomas, among many other things the inspiration for Robert Zimmerman’s stage name¹, came first, a welcome re-read. What I hadn’t noticed the first time through, or what at least didn’t make much of a dent in my memory bank, was a startlingly great quote from Hugh Kenner. ¹ So far, I have reserved judgement on Bob Dylan’s winning of the Nobel Prize for Literature, but I’m leaning towards The nostalgia and narcissism of the Boomer generation triumph again. Interesting choice. People paid attention, but I’m not sure it does anything for literature, which continues to have a declining coolness index unless I’m wrong (I hope I’m wrong). ³ Also true to form, I will now find an obscure way to connect this literary life to basketball: Kenner was born in Peterborough, Ontario, where one of the older high schools is Kenner Collegiate, named after Hugh’s father, a teacher. (A school named after a teacher?!) At least one of my teams has played at Kenner, so there. (But enough about me.) The knockout punch of the Dylan Thomas look-back came toward the end of the article, which argues that we should not look at the excesses, lifestyle and literary, of the Welsh poet but rather at the best of what he was and what he did. Author James Parker reminds us of the famed McLuhan aphorism: The medium is the message. Parker advises, therefore: don’t look so much at this or that Thomas poem, which may by now feel dated or immoderate or just plain meaningless; instead, consider what the man himself meant, and attempted. At this point, Parker quotes Kenner’s explanatory paraphrase of The Medium is the Message. 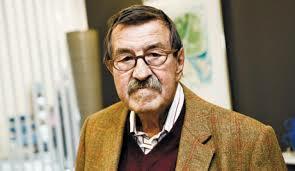 Gunter Grass died Monday. I remember my 1970s awe at an older friend, Kenny, who buried his beard and mighty forehead in John Barth and Grass and other literary lions I’d never heard of. Hundreds of heart throbs later, I still haven’t read The Tin Drum, or even seen the movie, but in my usual time-impaired way I expect I will be soon. Because the man has died, and the man wrote fearlessly of the business of being German during and after that nasty Nazi business. He took considerable heat for revealing, in 2006, after a lifetime of calling Germans to account and to remember, that he himself had been drafted into the SS as a 17-year-old. Too late! they cried. Hypocrite! I beg to differ, and so do most commentators who are better-informed than I am. So does anyone, I would think, who has actually read his account. It is deceptively laconic, describing almost whimsically the conditions of war-time Germany and of an ignorant, artistic lad who sought to escape poverty and insignificance. I got to read this New Yorker article by Mr. Grass thanks to smart Tweeters: http://www.newyorker.com/magazine/2007/06/04/how-i-spent-the-war?mbid=social_twitter (Sorry, I’m unable to hyperlink right now.) It’s an entrancing read, and I highly recommend it. That he survived was a fluke, several flukes in succession. RIP, Gunther Grass. I’m reading Malcolm Gladwell’s latest, David and Goliath. Like most of his books, this one takes things that we blandly believe to be true and asks questions, tells stories, and cites research to suggest that they ain’t necessarily so. In Blink, for example, Gladwell challenged the idea that sound decisions come only after long reflection, that following an impulse is always a bad idea; his Outliers is one of several recent books that punch holes in our belief in the solitary genius, the I-did-it-my-way exaltation of individualistic accomplishment. David and Goliath argues that it wasn’t such a big upset when the shepherd boy stoned the slow-moving giant — he made what appeared to be a disadvantage into his ace-in-the-hole, by not playing the game the way the Philistine Tallboy arrogantly assumed it would be. In a chapter that spotlights the unusual proportion of noted entrepreneurs who suffer from dyslexia, Gladwell cites an advantage they have: used to being outcast, at failing repeatedly, they are not only inured to difficulty but they may also be less afraid to be disagreeable. 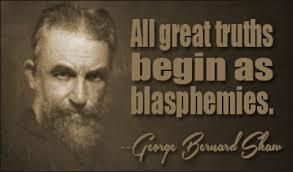 At which point, Gladwell quotes a beloved old chestnut from George Bernard Shaw, and I get to my point! Jonathan Franzen is the great American novellist (The Corrections, Freedom, and a brilliant non-fiction collection called How To Be Alone, among others). He paid the most breathtakingly erudite tribute to Ms. Munro in a 2004 New York Times review of her collection Runaway. This remarkable piece lauds the greatness of Alice Munro, and criticizes literary fashion and our culture’s blindness, in one restless, contrarian, impassioned and unpredictable essay.